I have been working the past two weeks on teaching my K and 1 group about rotation and revolution. Last week, we modeled rotation and revolution. First, we spin around and around and say revolution three times, then we switch directions. We do this on the carpet and if anyone feels dizzy, they get to sit down. This activity gets giggles and grins, galore! We also get my globes out and practice rotating them. Next, we all pull a chair out with plenty of space around them and practice revolving (or orbiting) the chair. Finally, I challenge them to rotate and revolve aroung their chair at the same time. In the past, I have had them make a sun to tape to their chair, and an earth (paper plates) hung around them with string, but this year I ran short on time. In first, we also discuss what earth looks like from space. We take a paper plate, fold it in fourths. 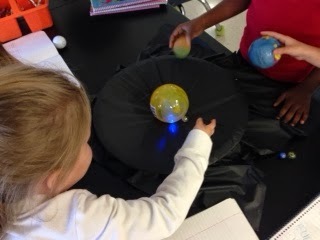 I tell them to color it blue, however many parts they think the earth has water on and green for the land. They are usually amazed the the earth is 3/4 water. Then, for those that know their address, we travel from space to their house via google earth. This is always a big hit! This week, I cut up a black plastic tablecloth and used string to tie a piece around a large round tupperware container. 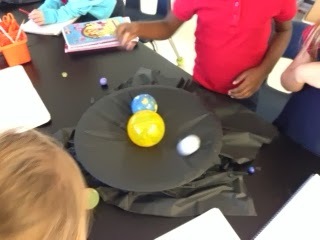 Students get various balls and the tupperware container "our solar system" and have to orbit the smaller balls around a big one that they place in the middle. I saw this activity on a Bill Nye episode years ago and it is easy and fun! I have enough supplies for each table/four students per table. Balls from the dollar tree...I even found suns and mini globes! Rotation occurs when something is spinning around an axis. What are some examples of things that rotate? What is the difference between rotation and revolution? Rotation occurs when an object spins around an axis. Revolution occurs when an object spins around another object.